This carefully curated auction features several categories of rare books, including out-of-print and reference books on diverse scholarly subjects, at attractive prices. Among the top lots are an immaculate copy of The Constitution of India in its original delivery case (lot 103), two vintage books about Mahatma Gandhi (lot 77) and three bound collections of the Tata Review from the library of Mr. J J Bhabha (lot 130). The auction includes works by experts and academics such as Mulk Raj Anand, Karl Khandalavala, George Michell, Ananda Coomaraswamy, Stella Kramrisch, and C Sivaramamurti to name a few. The selection covers a variety of specialisations including architecture, Indian temples, textiles, arms and armour, photography, miniature art, design, love and erotica, and the visual and performing arts. Among other highlights are volumes of historical interest, such as publications by The Archaeological Survey of India, The Gazetteer of Bombay City and Island, and vintage government publications. Sales touched a total of Rs 16,96,588(US $24,588) Read more..
All lots will be shipped out in an ‘as is’ condition, meaning that the item is sold with all existing faults and imperfections. StoryLTD encourages all potential buyers to inspect each item carefully before bidding and to not rely on an illustration of any item given in the catalogue. Condition reports for all lots are available as a free service, online or upon request by email, fax, or telephone. Each lot has a price range listed. These estimates are based on characteristics of the lot such as condition, quality, rarity, provenance. These estimates are provided only as a guide for buyers and do not include buyer’s premium or applicable taxes. If applicable there is a link for pricing achieved for similar artworks at auction available next to the lot in the online catalogue. Price estimates may be subject to revision. Bidders are advised to register at least 24 hours in advance of the sale. Bidders may choose to register online by going to the “Get Bidding Access” link on the auction catalogue page. For more information, see “How do I bid in the StoryLTD auction” on our “How to Bid” page. If you have bid or been approved to bid with us before, please use your StoryLTD or Saffronart login and password to accept the Conditions for Sale online. Please note the invoicing details provided at the time of registration cannot be changed after the sale. i. Bidding Online: Once you have identified the lot that you would like to bid on, click on "Bid Now" and enter either the bid amount for regular bidding, or a maximum price for proxy/automatic bidding. Regular bidding is the method by which you actively participate in the bidding process by entering the next valid bid (or one of a higher value) each time you are outbid. Your screen will display the next (minimum) valid bid, based on a predetermined increment. You may enter a bid at that exact value only. You may also view the entire bid history prior to making your decision. After you enter your bid, it is advisable to view the bid history to verify that your bid has been recorded. Please note that bidders may be contacted during the auction for bid verification in order to protect all bidders and maintain the efficacy of the process. ii. Bidding on the Phone: StoryLTD accepts requests from bidders to place bids on the phone with our staff depending on availability. To avail of this service, you must be registered as a bidder. Please note that the number of telephone lines available for telephone bidding may be limited and this facility is provided at StoryLTD’s discretion. iii. 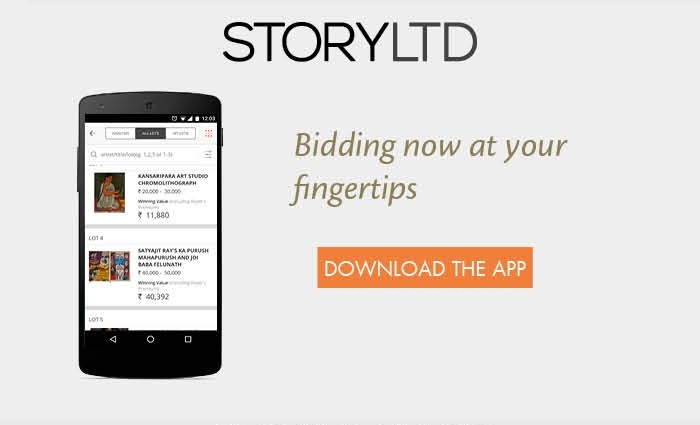 Bidding on the Mobile: Bidders may download a software application from StoryLTD onto their eligible mobile device and use it to place bids during the sale. To avail of this service, you must be registered as a bidder. Visit the App Store for iOS, and the Google Play store for Android enabled devices. Any new bid must be greater than the current highest bid by a minimum increment. The next valid bid amount is the current highest bid plus the minimum increment value. The auctioneer may vary the increments during the course of the auction at his or her discretion. Online bids however, are accepted only at the next valid bid based on the minimum increment. Once the auction has started, bids may not be cancelled by a bidder. However, the bidder may choose to lower the maximum value on a proxy bid during the auction if the bidder's maximum (proxy) value has not yet been reached. StoryLTD reserves the right to cancel a bid at its discretion if it considers it necessary to do so in order to protect the efficacy of the bidding process. Bids may be placed in US Dollars (USD) or Indian Rupees (INR). However, only buyers in India may pay for their purchases in INR at the close of the auction. All other buyers must complete payment in USD. Certain lots have been marked with the sign . These lots are not situated in India and therefore, may only be bid for and purchased in USD. Persons residing in India wishing to bid in USD must be eligible under the various foreign exchange regulations to make payments overseas. Please contact StoryLTD for further details. Please see the exchange rate section in our Conditions for Sale online. i. If the proxy bid is less than the opening bid value it will be recorded and displayed below the opening bid value at the time of the start of the auction in the bid history for that particular lot. ii. If the proxy bid is greater than the opening bid value and is less than the next valid bid for that lot (based on the minimum increments) it will be recorded and displayed as the current highest bid above the opening bid value at the time of the start of the auction in the bid history for that particular lot. The next valid bid in this case will be greater than the current highest bid by a minimum increment, which applies to that bid value. iii. Multiple proxy bids received on a particular lot before the start of the auction will be recorded and displayed in the bid history of the lot according to the values with the highest bid being the current valid bid at the time of the start of the auction. Absentee/proxy bids received at the same value will be prioritised based on the time of receiving the bids and will be shown in the bid history of the lot. Bidders can keep track of their bids by hitting the "Bid History" link below the "Bid Now" button, adjacent to the image of each lot. By tracking bids for particular lots, bidders can view bid increments, the date and time at which the bid was placed, and what the current bid stands at. For ease of tracking bids, bidders are advised to assign bidding nicknames to themselves when prompted. We encourage bidders to set proxy bids for lots they are interested in well in advance of the closing time for a lot. In respect of each sale at the auction, StoryLTD shall charge a Buyer's Premium calculated at 20% of the winning bid value on each lot up to and including USD 1,500,000; 15% of the winning bid value in excess of USD 1,500,000 up to and including USD 3,000,000; and 12% of the Winning Bid in excess of USD 3,000,000. For lots being shipped from India, a GST (Goods and Services Tax) at applicable rate on the Buyer's Premium shall be to the account of the Buyer. This is applicable for deliveries within India as well as overseas. If you win a bid, you will be sent an email after the close of the auction, containing an invoice for the winning bid plus additional charges (shipping, handling, duties and taxes as applicable) and the Buyer’s Premium plus service tax at applicable rates. The invoicing details provided at the time of registration will be used to raise the invoice and no changes will be accepted after the sale. You may review acceptable modes of payment described in the section below. 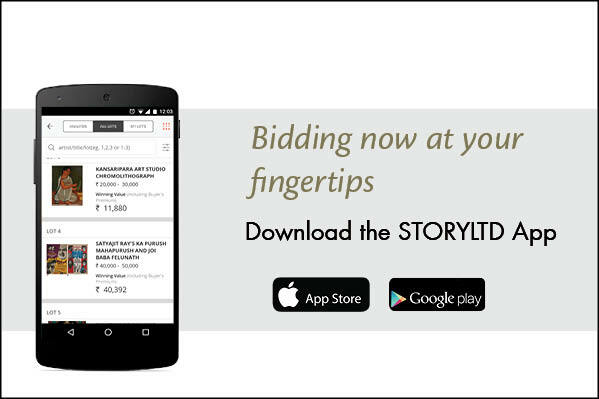 If you are the winning bidder, you are legally bound to purchase the item from StoryLTD. Please note that purchases will not be shipped out until payment has been received and cleared. i. Deliveries in India for lots originating in India: Any sale of lots originating from India to an address in India is subject to a GST As Applicable on the winning bid value and a on the Buyer’s Premium. A CST of 2% instead of the GST As Applicable will be applicable on the winning bid value only if the purchasing entity is a business; the delivery location of the lot is outside the state of the location of the sale as mentioned in the Sales and Enquiries section of the catalogue and the Buyer provides the necessary documentation required by the Sales Tax authorities. The final charges will be determined at the close of the auction and will be sent by email to the winning bidder. ii. International shipments for lots originating in India: For lots originating from India, a on the Buyer’s Premium is applicable. There may be duties and taxes levied depending on the delivery destination which typically will be on the total of the winning bid and shipping and handling values. Depending on the shipping address, these duties and taxes vary according to customs regulations in the destination country. Any shipments to EU countries will be charged an additional VAT as applicable. Please contact StoryLTD for further details. (iii) Shipments and Deliveries for Lots originating outside India (lots marked with the symbol ) These lots are located outside India. Persons residing in India can bid on and pay for in USD by complying with the appropriate foreign exchange regulations for making overseas payments. There are import duties applicable on artworks shipped into India. Please contact StoryLTD for further details. In the event that the lot is to be shipped internationally, additional charges for international shipments mentioned in the above section shall apply. Purchases shipped out within 10 - 15 business days of the payment being cleared are insured under the terms of StoryLTD’s insurance policy (please note that frames are not insured). If there is an expected delay in dispatch, the buyer will be informed of the delay via email, unless the buyer has indicated an alternative preferred mode of communication. Buyers may choose to collect their purchases from the Saffronart office in Mumbai. In such cases, buyers are requested to make an appointment to collect purchases within 10 - 15 business days of completion of all payments and documentation formalities. Buyers who have completed payment formalities and have not taken delivery of their lots from StoryLTD within 30 days of the completion of payment formalities will be charged storage and insurance at applicable rates. Upon confirmation of delivery or receipt of shipment, we will send you the invoices for your purchases along with any relevant documentation for the lot that has been mentioned in the lot details. Please note that StoryLTD does not issue any authenticity certificates and does not provide artist authenticities either. All purchases from this sale are final. In the unlikely event of your receiving a damaged product, please notify StoryLTD directly within five days of receipt of the lot. Please call or email us at any of our locations mentioned in the Sales and Enquiries section. If StoryLTD does not receive any notification within 7 business days of delivery, it shall be assumed that the lot has been received in good condition, and no claims will be entertained. i. Lots marked with are not situated in India and therefore, may only be bid for and purchased in USD. Persons residing in India, wishing to bid in USD must be eligible under the various foreign exchange regulations to make payments overseas. Please contact StoryLTD for further details. ii. Lots marked with indicate that StoryLTD owns the lot in whole or in part or has an economic interest in the lot equivalent to an ownership interest.